On June 3rd I attended the Sassy City Chicks media preview at 7 W 34th Street, allowing me early access to the discount shopping event with jewelry, apparel and accessories up to 80% off. This was the first Sassy City Chicks sample sale I've been to, and I look forward to going again the next time it's held in New York! Upon check-in, I received a gift bag filled with goodies from Eve Pearl, Xtreme Lashes, Pixi, Talika, Frederick's of Hollywood and more. I wasn't expecting to find anything for myself, but I ending up buying a few great pieces! At istylelist.com, I found a green/white paisley XS/S tunic for $35 by Classique, perfect to wear poolside for my upcoming spa and resort trip. Since I had to go back to work after the media preview, I had no choice but to settle for non-alcoholic drinks until later in the evening. I love the Vita Coco - 100% pure coconut water, especially the acai & pomegranate and peach & mango flavors. I also enjoyed the OOBA sparkling hibiscus drinks,which come in a variety of flavors, including hibiscus, blackberry, lime, kiwi, orange and pineapple. I spotted some cute tanks by Sabo, in floral prints and swirly and damask burn-outs, with a 28" length. 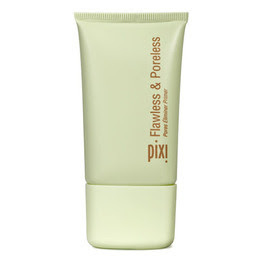 I can't wait to try Pixi's Flawless & Poreless lightweight primer, $28. Pixi is available online at pixibeauty.com, target.com and Target stores nationwide. When I came back in the evening during the fashion bash, I also found a cobalt blue halter dress by Double Zero for $30 at Hidden Treasures Boutique and a beaded handbag at Laugoa for only $20! I can even remove the strap off and use the bag as a clutch! The beaded bag I bought is the one shown here in the bottom right corner. They had a bunch of different, fun colorful bags. The bag right next to the beaded one was so Twinkle-esque - I love it! I saw a great maxi dress at Volang Boutique but unfortunately they didn't have my size. They have a shop at 290 Graham Avenue in Brooklyn. I don't ever make it out to Brooklyn but I'm going to have to start - I know there's a ton of great boutiques and restaurants there. As for alcoholic beverages, Offley White Port and Fox Barrel hard apple and pear ciders were being served. They were all light and refreshing.